KUMON - South Horizons, Welcome! What is Kumon? What's New? The Kumon method was found in 1958 by Toru Kumon, who was a senior high school teacher of math. When he taught his son math, he found that traditional text books were so boring that they failed to arouse any interest in children. Toru Kumon believed that children's potential could be totally developed with a self-study and independent learning method supported by gradual progress which is designed according to their own ability. 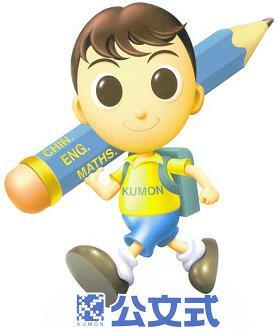 The Kumon method originated in Japan and is widely accepted in more than 40 countries around the world. There are are over 3,020,000 students using the Kumon Method. Confidence, Self Esteem, Concentration, and Self Studying Skills are some of the key elements of the Method. Consistency is important, and NO Pressure for the child. More information here. We are the ONLY Education Department Registered Kumon centre in South Horizons. That means our centre's facilities fulfill all the requirements set by the Education Department, Health Department, Housing Department, Fire Department, etc. to ensure your children's safety while they are in class. New location - New Name ! We have moved. The new location is better, brighter, bigger; and offer more space and facilities for students. The new address is Shop 388D (3rd floor) in Marina Square East, (see map) and is just on the opposite end of the same floor. Car parks are also available in Phase 3, 4 and Marina Square. Come to see us soon! New classes are always starting, call for details and free orientation and diagnostic test for your child. Who is KUMON South Horizons? 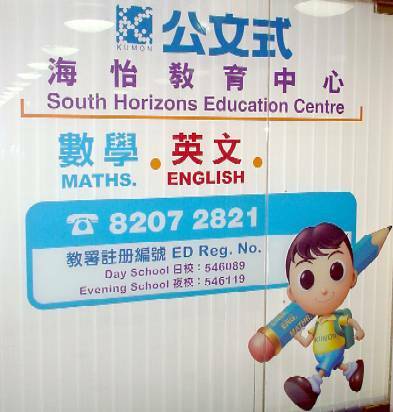 Kumon South Horizons Education Centre, located at the 3rd floor (Shop 388D) of Marina Square East, is the only certified Kumon Learning Centre (registered with the Education Department - 教署註冊) servicing students in the South Horizons area in Hong Kong. The Kumon South Horizons Education Centre provides a bright and comfortable environment for learning. The Centre is managed by its principle instructor, Ms. Stella Lee.